The Fender Modern Player Tele Thinline Deluxe Black Transparent casts an already distinctive classic Telecaster model in a whole new light, .. The Fender Modern Player Tele Thinline Deluxe Black Transparent casts an already distinctive classic Telecaster model in a whole new light, with a full-throated pair of single-coil Modern Player MP-90 pickups. 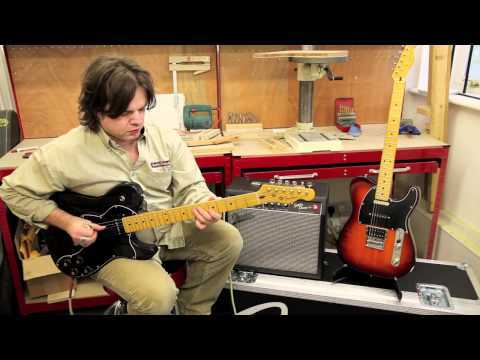 What do you get when you leave a classic Telecaster in the hands of Fender's master craftsmen? The Modern Player Thinline Tele! If you're after something to really stand out from the crowd, the chambered semi-hollow body offers a rich, woody tone, enhanced by a growling pair of P-90 pickups. The modern Strat-style hardtail bridge locks things in place for perfect tuning and reliability. Other features of the Fender Modern Player Tele Thinline Deluxe include a mahogany body, C-shaped maple neck, maple fretboard with 9.5 radius and 22 medium jumbo frets, three-way toggle pickup switching, three-ply pickguard (black-white-black on this Black Transparent model), four skirted amp knobs (two volume, two tone), vintage-style tuners and nickel/chrome hardware.